The V&A has unveiled plans that will revolutionise how its world-leading collection of art, design and performance is accessed, explored and experienced. 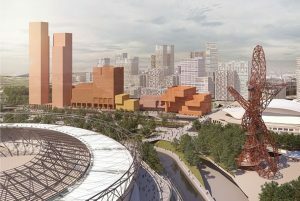 The V&A East project will create two interconnected sites in Queen Elizabeth Olympic Park – a brand-new museum at Stratford Waterfront, and a new collection and research centre at Here East. They will open in 2023 as part of East Bank, the £1.1bn powerhouse of culture, education, innovation and growth taking shape in the park as part of the Olympic legacy. V&A East will also host a unique and unprecedented partnership between the V&A and the Smithsonian Institution – the largest museum and research complex in the world. V&A East will provide a 360-degree view of the V&A, and illuminate the breadth of its work in ways that have not been realised before. Situated within the vibrant creative hub of East London and surrounded by four of the city’s fastest-growing and most diverse boroughs, V&A East will be firmly rooted in its local neighbourhood and global in outlook. At Here East, the new collection and research centre will reinvent the idea of a museum store. Visitors will be invited on behind-the-scenes journeys that uncover and demonstrate how and why objects are collected, how they are cared for, conserved, researched and displayed, and how they help make sense of our past, present and future. 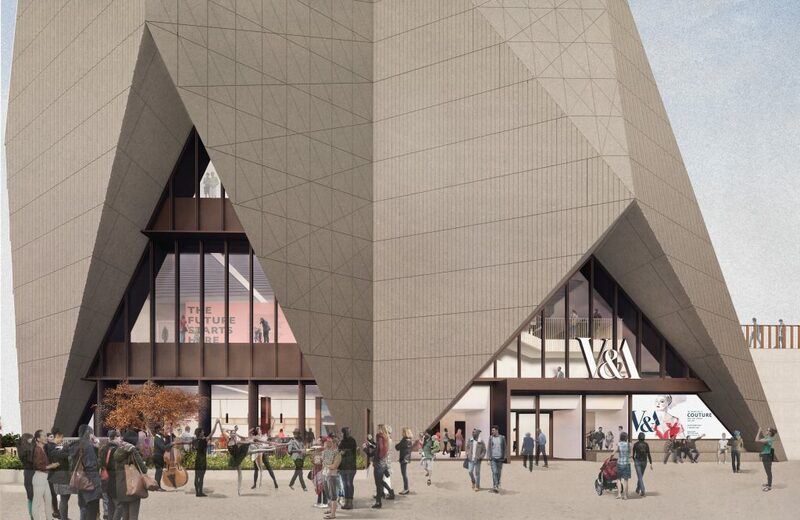 The centre will be a purpose-built home for 250,000 objects and an additional 917 archives spanning the breadth of the V&A’s collection from fashion, textiles, furniture, theatre and performance, to painting, sculpture, ceramics, glass, design, architecture, and digital. With a design led by New York-based practice Diller Scofidio + Renfro (supported by Austin-Smith:Lord), the collection and research centre will bring treasures out of storage and into public view for the first time in generations. A central public collection hall will turn the store inside out, with a rich array of objects on rotating display for visitors to explore – from some of the V&A’s smallest curiosities to the largest and most significant rooms and building fragments in the collection. Highlights announced today include Frank Lloyd Wright’s 1930s office for Edgar J. Kaufmann – a unique and complete 20th-century plywood interior – and a 15th-century marquetry ceiling from the now-destroyed Altamira Palace near Toledo, Spain, which will be resurrected within the centre as a real architectural element above a new public space for displays and events. Further spaces within the centre will host pop-up displays, workshops, performances and screenings alongside live encounters with the museum’s work – from conservation and research to exhibition preparation. This new model builds on the continued success of The Clothworkers’ Centre for the Study and Conservation of Textiles and Fashion, which will be relocated to the new centre from Blythe House in west London, where a significant proportion of the V&A’s collection is currently stored. A dedicated viewing gallery will be created to showcase a changing display of rarely-seen large rolled objects from the V&A’s extraordinary collection of theatre stage clothes, carpets, textiles, tapestries and paintings, including a 15-metre-wide theatrical backcloth designed by Natalia Goncharova for the 1926 Ballets Russes London production of Stravinsky’s Firebird. Ten minutes’ walk away at Stratford Waterfront, a five-storey museum designed by Dublin-based architects O’Donnell + Tuomey will provide a panoramic view of the designed world, and offer contemporary and cross-cultural perspectives. 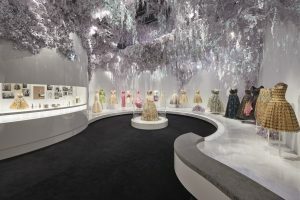 Two galleries will showcase the full range of the V&A’s collections and a programme of major exhibitions will sit alongside new commissions, installations and interdisciplinary collaborations and projects. Three outdoor terraces will give spectacular views across the Park. A pioneering partnership with the Smithsonian Institution will deliver an innovative exhibition programme and a jointly-curated gallery at the Waterfront, bridging art, design, science and the humanities, and deploying the collections of two world-renowned cultural institutions to reflect issues and themes that resonate with contemporary society. The museum’s inaugural exhibition in 2023 will be a world-first co-production by the V&A and the Smithsonian, after which the latter will present one in four exhibitions at the museum. The museum at Stratford Waterfront will sit alongside UAL’s London College of Fashion, a new, mid-scale venue for Sadler’s Wells, and new BBC studios for performance, rehearsal and broadcast – its founding partners in the East Bank project as part of the legacy of the London 2012 Olympic and Paralympic Games. The partners are already active in east London with programmes of events, collaborations and activities developed together with local organisations and involving thousands of people from across the Olympic boroughs. Building relationships and networks across the many and varied local communities of east London is helping shape the collective East Bank project and ensure it is firmly rooted in its new neighbourhood by 2023. V&A East’s two venues will be open to all, from families, schoolchildren, students, artists and designers, to tourists, visiting academics, cultural enthusiasts and curious passers-by. People across the neighbouring boroughs are already helping to shape the project, and the V&A will continue to forge new partnerships as the project develops. This entry was posted in NEWS and tagged The V&A, V&A East. Bookmark the permalink.